Introducing the JR Elix Aquaplate range of round domestic and semi-rural tanks. 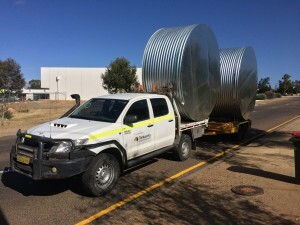 They have been iconic to South Australia for over 30 years, and built to last with all tanks being manufactured at our Mannum Tank Facility using galvanised Aquaplate corrugated iron, from 450L up to 18000L. •Perfect for “hard water” (bore water or river water) applications. •Some Bluescope colorbond colors are available, as well as traditional Galvanised finish. Galvanised Iron, Woodland Grey, Windspray, Deep Ocean, Paperbark, Pale Eucalypt, Wilderness and Cottage Green. •Colours available: Woodland Grey, Windspray, Deep Ocean, Paperbark, Pale Eucalypt, Wilderness and Cottage Green. A 20 year corrosion warranty is provided for the Bluescope AQUAPLATE ® steel component, and Elix Tanks offers a offers a 10 year warranty on its industry leading construction workmanship. A long lasting tank that you can rely on.